Find unconditional love, wrinkles and your new best friend. Your furry family member could be one click away. Make your dollars count by helping us provide medical care, food, shelter and a soft place to nap the day away, for our rescues. We are an organization of volunteers who are passionate about The Bulldog. Our mission is to ensure all Utah bulldogs have a family to call their own. 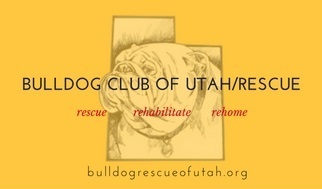 The Bulldog Club of Utah's Rescue Committee rescues lost, abandoned, and unwanted English Bulldogs and places all adoptable Bulldogs in new homes. We are a 501(c)(3) non-profit organization and Best Friends No Kill Utah (NKUT) Coalition member.